I’m very pleased to share with you the release of these three essays. Those who have read Eye Spy will be especially interested in the essay on cannibalism. They are all currently available online as individual purchases, and the three essay bundle will be available very soon. Last week a close Moroccan friend and I met for our weekly cup of tea at our usual café. Smiling, I asked what he meant. My friend went on to tell me of how he had been received at an American family’s home in Casablanca the week before. Following that visit, he invited the American family to his own home. A series of lost in translation moments had punctuated both visits. As someone with one foot in the East and the other in the West, I could see the difficulties and, for this reason, I wanted to present a list of do’s and don’ts for Westerners living in Morocco. Take a gift, however small. Not to do so when arriving for a social visit is almost unthinkable. If there are children there, take something for them, or something straight-forward such a platter of pastries. Better to take more than less. Don’t expect a tour of the house, or ask for one. Bedrooms and anything but the formal salon, will be probably off-limits, unless you know the family well. Don’t be surprised if the television is left on all through the visit. TV is regarded as background noise in Morocco. Don’t worry if people come in and out endlessly, while you feel awkwardly rooted to one formal chair. You’re a guest and, as a guest, you’re expected to be seated while everyone honours you. At prayer time members of the host family might slip out, pray, and then return. And, as a respected guest, an abundance of food will be provided. Don’t gorge yourself on starters, as there will probably be large platters of cooked meat to follow. The choicest pieces of meat may well be picked out and served to you. Don’t worry if you have to leave a little, because that’s fine in Morocco – just as eating every crumb is a sign that you are still hungry. Do not help yourself to drinks, but wait for your hosts to serve you. If eating from a communal dish of couscous or a tagine, keep to the triangle of the dish in front of you. Don’t praise an individual object in the home too much, because it may well be presented to you as a gift. Don’t take wine or an alcoholic drink unless you are very certain that the hosts drink. Do make polite conversation, declaring how you adore Morocco, and Moroccan culture. Don’t launch into politics or religious matters. Irrespective of whether you are the guest or the host, your children will be kissed by all. And, if it’s a conservative household, men either kiss each other’s cheeks (if already close friends), and women kiss women’s cheeks. Men shouldn’t kiss women and vice versa, unless you know the family well or if you know them to be less conservative. A handshake is always a good bet unless a cheek is offered. On no account serve any dish containing pork or pork products. Don’t necessarily ask your guests what they would like to drink. It’s better to just serve tea, or whatever, or to pour various cold drinks and present them on a tray. Don’t offer wine or beer unless you’re pretty sure your guests drink alcohol. Never eat or drink anything until you are sure that your guests have all been taken care of. And never on any account help yourself to a second helping until all guests have taken what they need. If there’s a little food left at the end of the meal, never dive in and finish it if you are hosting the meal. Remember that when receiving people in your home, they are traditionally guaranteed security beneath your roof. This means that you are obliged to treat them with respect, and so it’s not the right time to launch into severe arguments. In Morocco, receiving a guest is regarded as an honour for the host, and so there should be an abundance of food. Don’t worry if you have many times what will be eaten, as you will be honoring your guests. Quantity, quantity, quantity. Don’t offer a tour of your home, unless the guests are close friends. Moroccans are always confused about the idea of the house tour. It’s largely regarded as absurd. Don’t stress if your guests sit in silence. In Morocco, as in much of the Arab world, silence is seen as a virtue and a medium through which people get to know each other. Don’t be offended if your Moroccan friends don’t send a message of thanks. It’s not something required in the culture. But, you are likely to receive a return invitation instead. 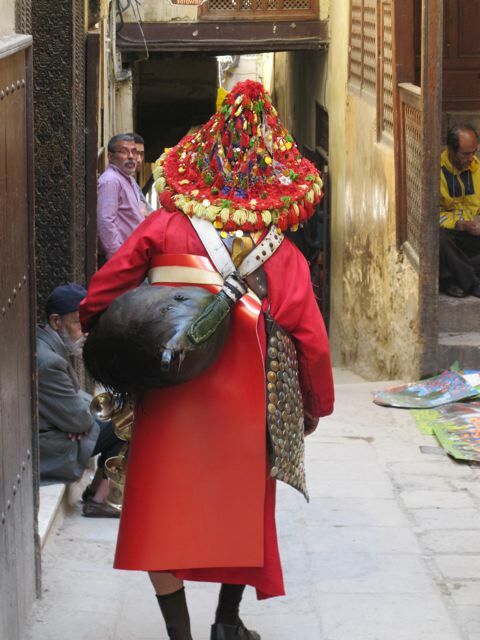 We have all seen them, in the flesh or in postcards, standing in the central square in Marrakech, bright costumes, ear to ear smiles, furry goatskins full of cool water dangling at their waists. Think Morocco and you think of the inimitable purveyors of water. Their costumes are red, wide Berber hats providing shade, shallow brass cups polished so brightly you can see your face in them, their shoes as shiny as a soldier’s on parade. The water sellers are so famous, so celebrated, that they’ve become icons in their own right, known throughout the kingdom and far beyond. But something has gone awry. These symbols of the exotic, slakers of the desert thirst, have moved on to a new realm. So extremely famous have they become that they no longer need to sell water at all. Most of the time they make money — and plenty of it — by posing for tourists in Marrakech and elsewhere. They’re mannequins for a zillion digital shots. In my travels I have become preoccupied by tourism and the effect it has on countries and on fragile facets of culture. Most of the time, and you know where I am heading with this, I’m not a big fan. And Marrakech is the quintessential example of a city in the middle of nowhere landing the big fish — a full on tourist bonanza that’s rolled up out of the blue. An Imperial Moroccan city, it was once many days journey from the anywhere, locked away in the desert. While, these days, it’s so unnecessarily accessible. And for me that’s the point. It’s too easy, far too easy, to get to Marrakech. In my opinion you should have to sweat blood to get there. Talk to me about Marrakech and I do tend to get hot under the collar. I’m sorry, but I do. And in the grand scale of things it’s the water sellers who have both been made and been broken by the cold hard tourist cash. Just up the hill from Dar Khalifa, where we live, there’s a traffic light. I spend a lot of time stopped there, staring out the car window. There’s usually an old water seller standing right there at the light. He’s ragged, his costume a far cry from his well-heeled kin in Marrakech. But he’s the real thing — a man who hasn’t sold out his tradition. And what irony there is in that. You have to come to Casablanca, the seemingly most European city in Morocco, to find the untainted vestiges of ancient culture. Live in Casablanca as I do, and you have to get used to a few things. Most of the time they’re good things, like the way complete strangers greet each other, or the way the young still have respect for the old. But there are things that take a lot of getting used to, none more so than driving from A to B. To drive in Casablanca you have to be a warrior. Opening the door of your much-dented vehicle and clambering in, you are a knight clambering onto his battle speed. The dents, scratches, gouges and scrapes, are all testimonies of battles endured and won. Every day the traffic gets a little worse, the gridlock a little more ferocious. Much of the time there may be very little movement, but the clamour of the horns and klaxons is like a hundred thousand harbingers of hell. And in this cutthroat realm of cacophony there is one place more feared, more tempestuous, and more draining on the adrenal glands, then any other. The infamous Marjane Roundabout. Ask anyone who’s ever driven in Casablanca if they know it, and their face turn ashen with alarm. It’s where six or more streets converge in a frantic, frenetic juggernaut wheel of life and death. I can’t tell you how many accidents I’ve seen there. It must be hundreds. Trucks on their sides, precious cargo strewn in a wide arc all around. Motorcyclists lying on the ground, limbs crumpled and contorted. Communal taxis set ablaze by the impact of a multiple pile-up. Mastering the Marjane Roundabout, positioning yourself exactly, learning to keep your cool, is a badge of honour. There should be medals awarded for anyone who has survived it, the best of them reserved for those who manage to complete a left turn. Morocco is unlike other countries when it comes to the left turn. In most countries, turning left is all about following the gentle arc made by the car in front, executing the manoeuvre neatly and without any fuss. But in Morocco, turning left is all about exercising one’s indomitable sense of individuality. No one lines up. To do so would be to make you the laughing stock of the roads. Instead, all the cars planning to turn left, position themselves side-by-side. And, as their passage opens up, honking and clamouring, they nudge forward in fits and starts, until the moment to charge. 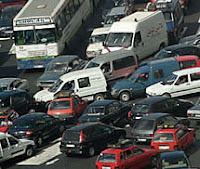 But at the Marjane Roundabout, the sheer pressure of traffic, the tension, and the fear, usually leeds to a stalemate – a knot of choking vehicles that simply can’t move. Even if the zillion-dollar Tramway did go where people wanted it to, I have a feeling no one would use it anyway. 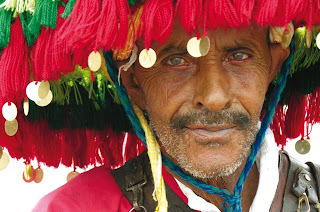 Because Moroccans are true individuals – and that’s what’s so amazing about them. They don’t like to be guided by others, or follow a path prescribed by anyone else. I may be the traffic’s worst critic, but I secretly love it as well. After all, every time I clamber into my car and venture out into the grinding slipstream of ferocity, I have no idea of what tumultuous encounters I’m about to hit headlong with my trusty battle steed. Trust in God but tie your camel well. The answer to a fool is silence. To its mother, the baby son of a serpent is a gazelle. That which is written on the brow will be seen in the eye. The wind doesn’t always blow as the ship would want it to. The dog barked but the caravan moved on. 1. The Arabs distinguished between astronomy and astrology for the first time. And astrology was regarded as a key science by the Abbasids. 2. Milky Way: Al-Biruni (Persian astronomer 11th century) proposed that the Milky Way was a collection of nebulous stars. 3. Ibn Bajjah (Avempace, 12th c.) concluded that the Milky Way was a vast collection of stars but appeared to be a continuous entity, because of the effect of refraction in the Earth’s atmosphere. It wasn’t until 1610 that Galileo studied the Milky Way with a telescope and discovered it was composed of a huge number of faint stars. 4. Arab astronomy developed numerous pieces of equipment for measuring angles, such as quadrants… and importantly, astrolabes. These were used for measuring the distance of celestial bodies above the horizon, as well as in determining latitude. Scientific Method includes the use of controlled experimentation, and the idea of quantifying results, to distinguish between competing scientific theories. What’s interesting is that this scientific method took off in a big way and was used across the board, and is still used by all scientists today. The first ‘modern’ medical experiment is known to have been carried out by al-Razi in the tenth century, when he was working out where to build his hospital in Baghdad. He hung pieces of meat all over the city and observed where the meat decomposed least quickly. It was there that he built the hospital.